Home > News > News > Country Superstar Martina McBride! 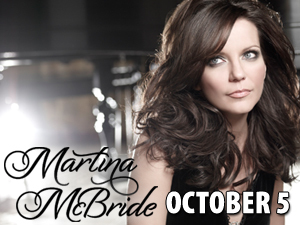 We’re thrilled to announce the addition of Martina McBride to our already amazing 2012 concert lineup. This powerhouse country vocalist will light up the stage with some of her hit singles, share stories from her incredible career, and present a few new songs from her latest CD Eleven. For a complete list of all our upcoming Celebrity Concerts and AMT Original Shows, click here.